The importance of the budget for effective service delivery in any country cannot be overemphasized. It has been recognised that the budget is perhaps the most important instrument for the development of any modern state apart from the constitution. It can be argued that it is only through the instrumentality of the budget that the government can allocate resources to deliver services to the people especially the poor and excluded. During military rule in Nigeria, citizens participation in the budgetary process was virtually non-existent. The reading of the budget every January was a mere ritual with no bearing to actual government expenditure. But on return to civil rule in 1999, expenditure by government is expected to be strictly in accordance with the 1999 constitution and appropriation act for each year. The first set of engagement by citizens groups on the budget on return to civil rule in the early 2000s focused essentially on budget analysis with emphasis on sectoral analysis of the budget. Meanwhile, from 1999 to 2016, there was steady economic growth and receipt of oil income of over N70 trillion. But this did not translate into poverty reduction or service delivery to citizens. Citizens groups now turned to analysis of transparency issues and frivolous items in the budget. The Centre for Social Justice (CSJ) and BudgIT have consistently analysed the budget for frivolous items for more than ten years. Similarly, CIRDDOC has carried out studies on transparency of the budgeting process at the subnational level in Nigeria. In 2016, a DfID project known as Partnership to Engage, Reform and Learn (PERL) commenced work on the budgetary process. The project identified the blockages to effective budgeting and public expenditure to include lack of transparency in the budget process; poor prioritization; frivolous expenditure and poor oversight. Its work has gone beyond the focus on sectoral analysis and frivolous expenditure to deal with issues of transparency and accountability; equity, geography, demography and structure of the budget. In particular, it has focused on equity issues and service wide votes and key areas that can bring fundamental changes to the budgeting process in Nigeria. It has facilitated consistent and rigorous analysis of the budget. It also facilitated the National Budget Group made up of Centre for Democracy and Development (CDD), Centre for Social Justice (CSJ), African Centre for Leadership, Strategy & Development (Centre LSD), Public Private Development Centre (PPDC), Basic Rights, BudgIT, Civil Society Action Coalition of Education for All (CSACEFA) and Nigeria Labour Congress (NLC). Many other partners active in the loose network facilitated by PERL include PMP, Jigawa; Kano Budget Working Group; Coalition of Civil Society in Niger; Coalition of Associations for Leadership, Peace, Empowerment and Development (CALPED) ;Coalition of Association in Kaduna State, CODE, NOA; Premium Times; Advocacy Partnership in Yobe State and Justice Development and Peace Commission (JDPC). Over the years, efforts made by citizens groups, private sector organisations and the media has yielded some gains in the budget process in Nigeria. There is clearly an improved engagement by citizens in the budgetary process. Discussions about the budget take place almost on a daily basis in the social media, newspapers, radio and television. Several citizens groups such as BudgIT, Centre for Social Justice, Follow the Money, CODE, African Centre for Leadership, Strategy & Development, NDEBUMOG, etc are tracking the budget. The Budget Office of the Federation has produced a simplified budget that citizens can engage with. The government has also set up the Citizens Budget Portal containing relevant budget information. On the citizens portal is an application that citizens can use to monitor projects and report. Citizens groups working with relevant committees of the National Assembly have developed tracking template that citizens groups can use to track the budget for the report to be used by the National Assembly for oversight. Citizens groups and the media are now more systematic in engaging the budget process. Several media platforms now have programmes dedicated to budget issues. In addition, there are marginal increases in allocation to the social sectors. In the 2000s, citizens groups were participating in the Medium Term Sector Strategy (MTSS) process. But from 2008-2015, the MTSS process was suspended but reintroduced in 2016. In the 2016/17, 2017/2018 and 2018/19 MTSS processes, citizens groups did not participate. But in the 2019/20 MTSS process, PERL in partnership with the Nigeria Economic Summit Group (NESG) facilitated the engagement of citizens groups. Citizens groups participated in the MTSS of several sectors including education, health, Science and Technology. The Citizens groups that participated include Global Centre for Human Empowerment and Entrepreneurship Development (GLOCHEED), Kano Budget Working Group, PMP, Jigawa, CIRDDOC, Enugu, Voice and Accountability Project (VAP), Yobe, and Nigeria Association of Small and Medium Enterprises (NASME). Over the years, citizens have attempted to engage the budget cycle from preparation, approval and implementation to reporting/feedback. One phase that citizens participation has been minimal is the budget preparation phase. However, in the last few years, there appears to be some engagement. For instance, some organisations such as Justice Development and Peace Commission (JDPC) utilized Town Hall Meetings to collate citizens-based project for input into the 2018 budget. Similarly, Kano Budget Working Group collated citizens demand from 115 communities across 44 Local Government Areas in Kano State and shared with their federal legislators. Since return to civil rule in 1999, citizens groups have engaged the budget appropriation process. This usually occurs after the presentation of the budget proposal to the National Assembly by the Executive. Partly as a result of advocacy by citizens groups, the first National Budget Hearing was held in February, 2017. By February, 2018, there was no sign of the second public hearing and citizens groups intensified advocacy and the second National Budget Hearing was held from 27th-28thMarch, 2018. Several citizens groups have participated in the National Budget hearings including JDPC, African Centre for Entrepreneurship, I-PAC, PLAC, CSJ, Centre for Democracy and Development (CDD), Advocates for Human Rights, YIAGA, Global Agenda, CSACEFA, African Centre for Leadership, Strategy & Development (Centre LSD), Price Water House Coppers, SDN, GLOCHEED, Citizens Rights Concern (CRC), PMP. At the second public hearing, the leadership of the National Assembly announced that public hearing has been institutionalized and will be held every year. Budget implementation is one area that citizens have been active especially in terms of monitoring budget implementation. Over the years, citizens’ groups and the media have been monitoring the budget process in Nigeria and the National Assembly has been doing oversight. Meanwhile, the volume of frivolous expenditure as captured by civil society is not decreasing and the work of civil society is not feeding the oversight work of the legislature. This is why Partnership to Engage, Reform and Learn (PERL) developed a budget tracking and reporting mechanism agreed by relevant committees of the National Assembly and Citizen groups. PERL reflection session with partners in 2017 indicated that many organisations are now actively tracking projects in the budget. These organisations include Connected Development (CODE/Follow the Money); Project Monitoring Partnership (PMP), Jigawa; Coalition of Associations for Leadership, Peace, Empowerment and Development (CALPED), Kaduna; Civil Society Coalition on Education for All (CSACEFA); and National Orientation Agency (NOA) . Finally, the audit process and reporting process is one area where there has been limited citizens participation. It is the last loop of the budget cycle and it determines how well the resources are utilised to provide services to citizens. The constitution provides for annual auditing by the office of the Auditors General of the Federation and States. The reports are supposed to be submitted to parliament to aid oversight function and published for use by citizens for advocacy. The challenge is that in the past, the report is always late and not accessible to citizens. In any case, the 2016 Federal Government Audit report has been released and published on the website of the Office of the Auditor General of the Federation. Increasingly, citizens groups are taking interest on audit issues. However, despite the gains from previous advocacy, there are still issues with the budget process especially with the process of making the budget and the content of the budget. This is why citizens groups must deepen their engagement with the 2019 budget process. The 2019 proposed budget is N8.83 trillion which is 3.2 percent less than the N9.12 trillion in the approved 2018 budget but 2.5 percent higher that the N8.61 trillion proposed by the President in 2018. The 2019 proposed budget is based on an Oil benchmark crude oil price of US$60 per barrel; an oil production estimate of 2.3 million barrels per day; and an average exchange rate of N305 to the US dollar; and target Gross Domestic Product (GDP) growth rate of 3.0 per cent. There are a lot of pending advocacy issues which needs to be dealt with to derive maximum result from the 2019 Budget. First and foremost, there are still issues with the process of making the 2019 budget. Although some citizens groups participated in the Medium-Term Sector Strategy (MTSS) process, there is still no systematic way of capturing citizens input into the budget process in Nigeria. Some of the MDAs are not very co-operative with citizens groups participating in the MTSS process. The oversight of the budget process by the legislature, civil society and the media is still weak. Citizens groups do not participate in committee hearings on the budget. The Public Accounts Committee which was very popular in the second republic is still not very effective. There is still confusion on the limits of legislative power in appropriation. Secondly, there is no much improvement in the content of the budget. There is still low budgetary allocation to sectors that will have impact on the lives of citizens such as Agriculture, health, education and infrastructure. For instance, while the budgetary allocation to education by Republic of Benin and Ethiopia is more that 20 percent of the total budget since 2012, that of Nigeria is less than 10 percent. In the 2019 proposed budget, the allocation to education is N620.5 billion (about 7.05 percent), a marginal raise of the total of N605.8 billion budgeted for the sector in 2018. It is very clear that allocation to education is very low in Nigeria especially when compared to other African countries: Burundi -16.59 % in 2010; 14.98 % in 2011; 16.43 % in 2012 and 17.24 % in 2013; Benin-25.02 % in 2012; 22.34 % in 2013; and 22.23 in 2014; Ethiopia 26.30 % in 2010; 29.67 % in 2011; 30.54 % in 2012 and 27.02 in 2013; and Madagascar- 19.78 % in 2011; 20.33 % in 2012 and 13.99% in 2013. Thirdly, there has always been issue with budget realism. In the past four years, the exchange rate has been fixed around N305 to the US dollar. This is very far from reality in the alternative market. Even the oil revenue is projected at 2.3 million barrels per day. The actual for 2016 was 1.83 mbpd; 2017 was 1.85 mbpd; and 2018 was 1.81 mbpd. There is a large variance between projected parameters and actual results. For instance, the OPEC quota to Nigeria is 1.9 million barrels per day but 2019 proposed budget is 2.3 million barrels per day. Fourthly, geographical analysis of the budget indicates that there is nostill no systematic way to ensure fairness and equity e.g. analysis of the proposed budget for ministry of Works, Power and Housing capital budgets indicates that 17 percent was allocated to FCT, 7 % to North East, 20 % to North West, 6 percent to North Central, 7 Percent to South East, 12 Percent to South West and 31 percent to South South. In addition, recurrent expenditurecontinues to increase, and capital expenditure continues to decrease. In the 2019 proposed budget, only 23.02 percent is allocated to capital expenditure. There is a need to increase capital allocation in the budget. This is crucial especially as part of this percentage is administrative capital comprising of budget for monitoring and evaluation; site visits and workshops. Meanwhile, capital expenditure is crucial for the development of any country as it is dedicated to the creation of new assets that leads to economic development. Timeliness of the passage of the budget has been a big issue in the last few years. The 2018 budget proposal was laid before the National Assembly on 17thNovember 2017 and signed into law on 20thJune 2019 taking a total of seven months and three days. 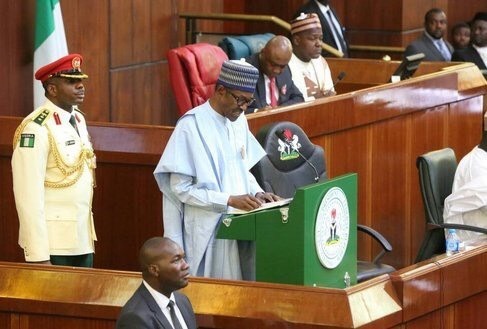 The 2019 proposed budget was laid before the National Assembly on 19thDecember 2019. The Fiscal Responsibility Act requires the completion of the Fiscal Strategy Paper by September each year and this has been hardly adhered to. There is the need to adhere to the Fiscal Responsibility Act and present the fiscal strategy paper and budget on or before September every year and ensure passage before the end of the year so as to return to the January- December budget cycle. There are structural and transparency issues with the budget process which needs to be dealt with. For instance, the budget structure provides for seven statutory transfers to the National Assembly (NASS), Universal Basic Education Commission (UBEC), Nigeria Judicial Council (NJC), Niger Delta Development Commission (NDDC), Independent National Electoral Commission (INEC), National Human Rights Commission (NHRC), and Public Complaints Commission (PCC). For the 2019 proposed budget, the allocations were N125 billion to NASS; N110.5 billion to UBEC; N86.14 billion to NJC; N95.19 billion to NDDC; N45.50 billion to INEC; N1.5 billion to NHRC and N4.2 billion to PCC. It is important to note that there are no breakdown of these transfers to facilitate tracking. In addition, every year, the budget devotes 4.18 percent of the federation account to special accounts for Ecological Fund( 1.0%); development of the Federal Capital Territory (1%); Stabilisation Fund (0.5%) and Natural Resource Development Fund (1.68%). The Ecological Fund is for the amelioration of general ecological problems in any part of Nigeria. Stabilisation fund is to be administered by the Minister of Finance for the purpose of initially augmenting any absolute decline in revenue suffered in any state arising from factors outside its control as a result of application of the revenue sharing formula in accordance with acceptable threshold and duration worked out by the revenue mobilisation, Allocation and Fiscal Commission (RMFAC). Natural Resource Development Fund (NRDF) is created to develop the non-oil sector particularly the solid mineral sector. Since these funds operate outside the budget process, there is the need for more monitoring and tracking. This is particularly important as the 2012 FGN audited report states clearly that “there is evidence of abuse in the administration of the three Extra-Budgetary Funds-Ecological Fund, Stabilisation Fund and Natural Resource Fund”. The alleged wrongful purpose includes for servicing budget deficits, giving loans to federal ministries, payment of identity cards programmes and payment of severance benefits. Moreover, the 2016 audit report has raised a lot of complaints including decreasing allocation to audit function, poor overhead releases against already inadequate budget and neglect of audit queries. The budgetary allocation for debt service in the 2019 budget proposal is N 2.26 trillion representing 25.6 percent of the proposed budget. This represents the highest share of the budget allocated to debt service since Nigeria’s exit from the Paris Club of debtors in 2005/2006. There is the need for monitoring of Nigeria’s rising debt profile. Input level: How much of the budgeted amount was released and used in implementation. Process:How was the activities carried out-Procurement process; are the activities happening as and at when due? Output is the immediate result of the activities e.g. how many kilometers of road tarred. Outcome is the effect of the budget activities or any change attributable to the budget activities e.g. expansion of market as a result of road tarred. Impact is change in people’s lives attributable to the budget. E.g improved quality of life as a result of improved income; improved livelihood and reduced accident from the road tarred. There is the need to measure budget performance beyond the amount of money spent to measuring performance at the three levels of input, process and output/outcome/impact. Another huge issue with the 2019 budget is service wide votes. Service Wide Votes became part of the budgetary process in Nigeria from 2003 to 2007. It was actually introduced to improve budget credibility and enhance fiscal discipline. Service Wide Votes is made up of unallocated funds set aside to meet genuine budget details of which cannot be ascertained at the time of making the budget because of sudden escalation of prices, contract variation, natural disasters, etc. The international good practice in budgeting is to set aside unallocated amounts for unforeseeable or indeterminate expenditure at the time of budgeting. But to promote transparency and accountability, it is recommended that “Contingency Budget” or service wide votes should be between 3 and 10 percent of the original budget. But service wide votes have increased steadily in Nigeria. It increased from N871 billion in 2015 (32.8%) to N1.14 trillion in 2016 (35.4%) to N1.3 trillion in 2017 (34.2 %) to N1.8 trillion in 2018 (37.6%) and to 2.14 trillion(30.5%) in the proposed 2019 budget. The budget is crucial in allocating resources and delivering services to citizens. In the last few years, there has been some improvement in the budgetary process especially in terms of citizens engagement, but a lot still needs to be done. There is the need to deepen citizens engagement with the budgetary process. Conscious efforts need to be made to create more awareness and advocacy for deeper citizens engagement in the budget process. There needs to be a systematic way to get citizens input into the budget through consultation, dialogue, town hall meetings, citizens charters and other tools. Secondly, citizens groups need to prepare evidence-based presentations to the National Assembly at National Public hearings to influence the process and content of the budget process. Thirdly, more citizens groups need to systematically track and monitor projects in the budget and submit report to the National Assembly for oversight. Fourthly, there is the need for the Ministry of Budget and National Planning and the Budget Office to institutionalise the participation of citizens groups in the MTSS process. Fifthly, citizens groups need to engage more with the audit process and engage in evidence-based advocacy based on the report of the Office of the Auditor General of the Federation. Finally, the Federal Government need to be responsive to the advocacy issues that have been raised by citizens groups over the years. The first issue is that of budget realism. The government need to amend the macroeconomic framework of the 2019 budget to be more realistic. The second issue is the need for more budgetary allocation to sectors that will have impact on the lives of citizens such as agriculture, health, education and infrastructure. The third issue is the need to eliminate items that can be considered as frivolous, inappropriate and unclear. Budget lines items should be clearly defined to remove any doubt and ambiguity. In addition, there should be geographical and gender balance for the budget. Furthermore, efforts should be made to reduce recurrent expenditure and service wide votes rather than increasing them.